When it comes to hosting events like Seminars, Meetings, Conferences, Webinars, Workshops, Parties, and Gatherings etc. in your WordPress website, Event Calendars are the best way to make your readers aware of these important occasions. Events Calendars play a major role in organizing small to large scale events and updating your visitors on upcoming happenings. Like any other type of plugin, there are many WordPress Event Calendar Plugins each with its own unique features. If you have never used it before, it can be daunting to find the most suitable one for your blog or website. For best functionality and flexibility, you need to go for Premium Event Calendar Plugin that offers more advanced calendar features. A quality premium plugin can do more than just informing users about an upcoming event. They can be used to provide comprehensive details of the events, Ticketing, RSVPs, Guest Management, Booking Forms, Email Notifications and much more. The market for WordPress Event Management Plugins is wide but our list has narrowed down to 10 of the best WordPress Event Calendar Plugins in 2018. First up on our list is EventOn. This is a premium high-quality WordPress Event Calendar plugin used by thousands of WordPress Websites across the globe. 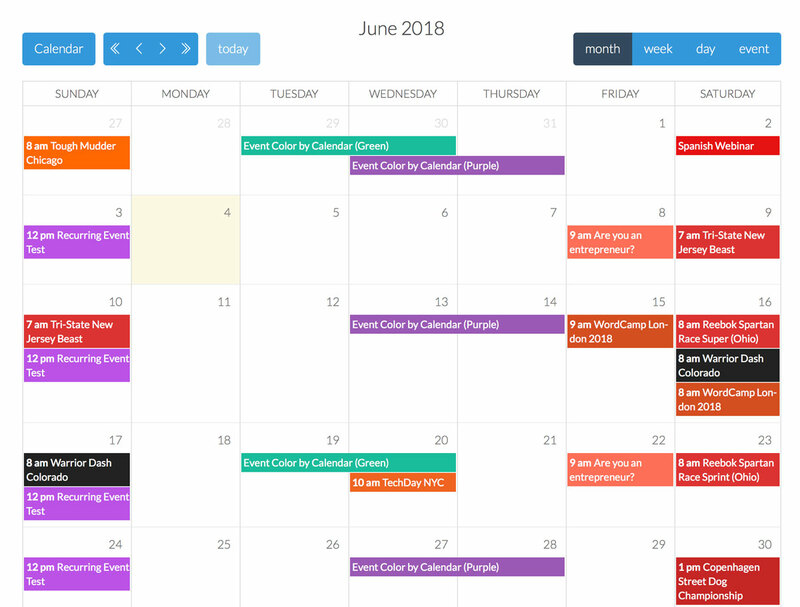 This fully-featured and stunning plugin is packed with multiple calendar layouts and a modern list that will help you highlight you events conveniently. You have the option to create a one-day event, multiple day events, and recurring monthly events. The powerful shortcode generator feature on EventOn will help you utilize it more effectively. 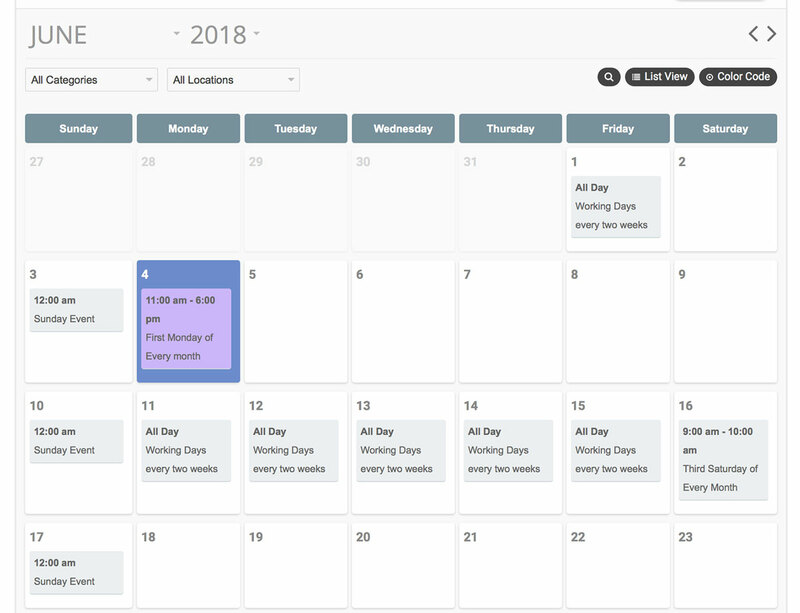 You can include specifics such as the event location image, times, event organizer contact info, and event cancellation on the main calendar page. EventOn plugin allows you to accept payments for events through PayPal. By fully integrating Google Maps with your events, your visitors can easily find the event’s location. You can also auto-archive past events, save locations and re-use them for future events. The Social Sharing Buttons in this RTL supported plugin will allow your visitors to share your events on different social media platforms. If you are looking to create a modern event site complete with an attractive and minimal design, look no further than Stachethemes Event Calendar. This premium WordPress Event Calendar plugin by Envato offers you an intuitive UI so that submitting events to your site is a breeze. This plugin is loaded with many amazing features like easy location management, photo gallery, guest list, weather forecast, recurring events and email reminder option. You can also display the special guests attending your event. The WooCommerce integration in Stachethemes Event Calendar helps you sell products and manage your online store easily. By displaying weather information, your visitors will be well-informed on how to dress up for the occasion. Events Plus is an Events Calendar Registration and Booking Plugin perfect for webmasters that need to create events, seminars, workshops, classes, concerts, conferences, and just about any event type. Built of the all-new Bootstrap 3.0 Event Display, Events Plus helps you to sell tickets, keep track of your attendees and manage your events effectively. The friendly admin interface and extensive documentation mean that you will have no trouble setting up an event of any type. Your users can register and pay for events using either PayPal or Authorize.net. Other notable smart features in events plus include Recurring Events, Multilingual Plugin support, Colored Categories, Sidebar Widget Ready and Wait List. 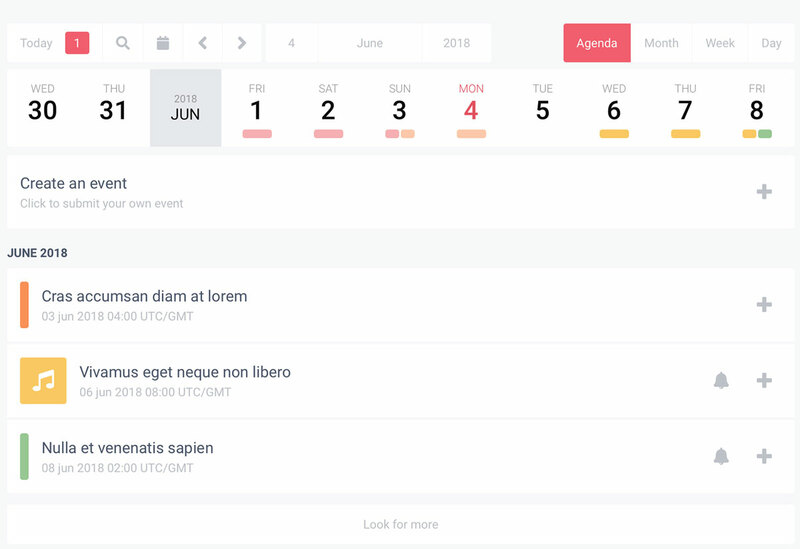 WordPress Pro Events Calendar is a premium and responsive WordPress Calendar Plugin that boasts an elegant design. 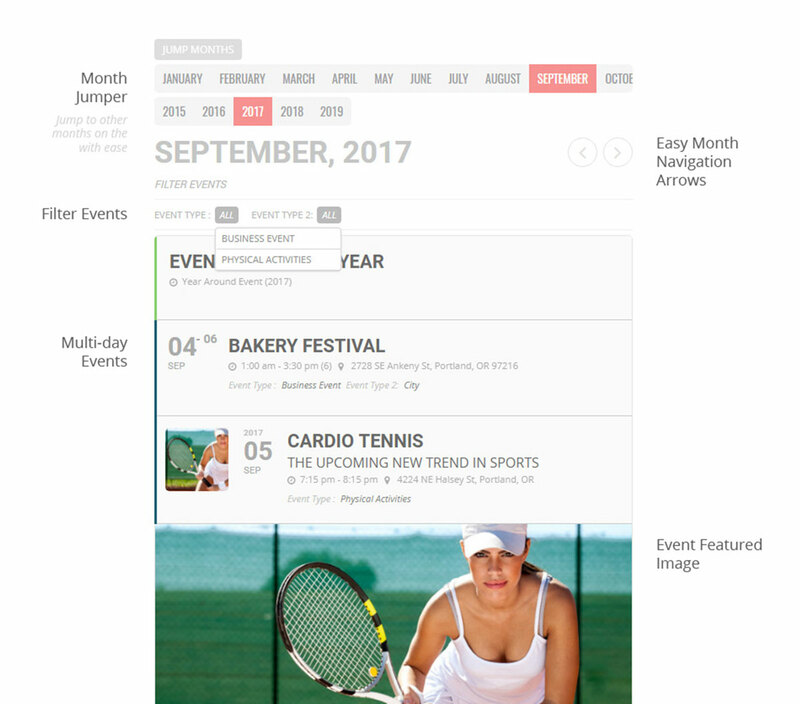 It offers a convenient way of adding stylish event calendars in your pages, posts or the sidebar. Its responsiveness takes care of all devices including smartphones, computers and tablets. This plugin is perfect for web owners looking for ease of access and useful features. It allows registered users to add events from the front-end. The integration of Google Maps with events in WordPress Pro Event Calendar makes it easy for event-goers to find your physical location. This plugin allows you to limit the number of bookings in an event and export booking list to Excel (XLS). Our list of WordPress Event Calendar Plugins would be not complete without Calendarize it! plugin. This is another premium WordPress Calendar plugin known for making a great calendar. 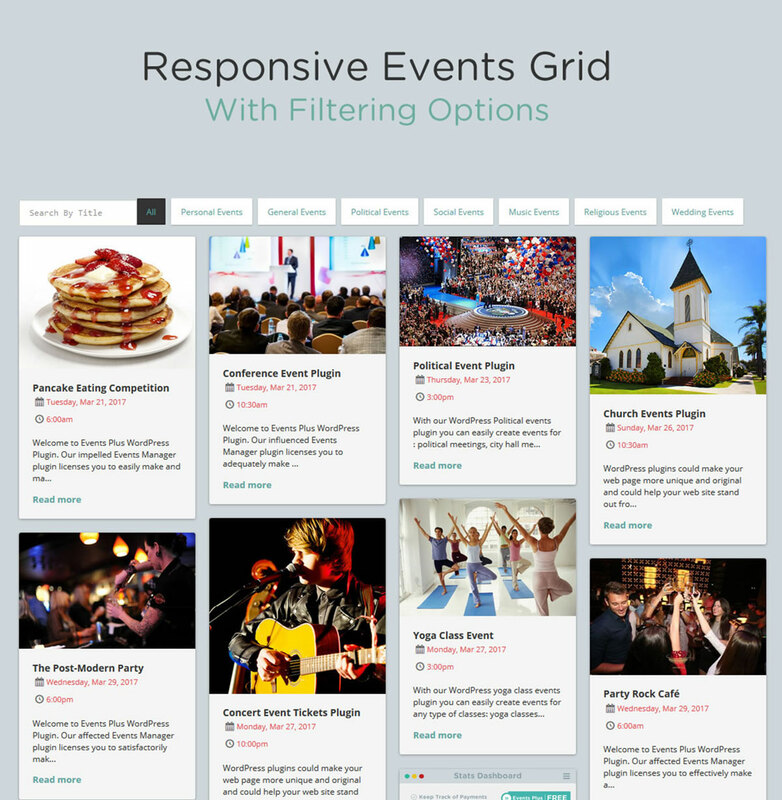 This plugin comes with several add-ons that will help you create an event of your choice. Notable mentions include social auto-publishing, importer tool, countdown module, ratings and reviews, and an accordion of upcoming events. You can translate this plugin using WPML or Easy Translation Manager. Language versions included in the plugin include Italian, Russian, Chinese, Spanish, French and English. The unlimited Color Schemes allow you to create your ideal color combination using the plugin’s Visual CSS Editor. Events Schedule is a simple yet versatile Premium Event Calendar plugin that lets you manage your classes or events with ease. On purchasing this flexible plugin, you are rewarded with many Useful Features, a Sleek Design, and 5 Timetable Styles. Create your schedule in minutes and add it to your page using Events Schedule’s Visual Composer element. The Compact List style in this plugin is popular for Seminars, Workshop, Conferences and Speakers while Large List style is best suited for Fitness, Dance Studio or Sports Center. Schedules with same classes every week are perfect for Schools, Beauty Parlors, and Medical Centers. Plain List Style best suits Sports Arenas, Music Festivals and Exhibition Centers. 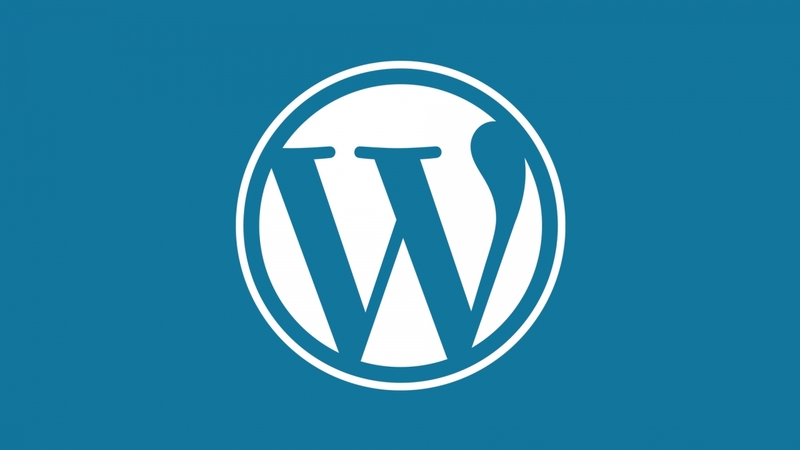 As far as security and compatibility of Events schedule are concerned, you can fully trust the plugin since it has been thoroughly audited by WordPress Experts. 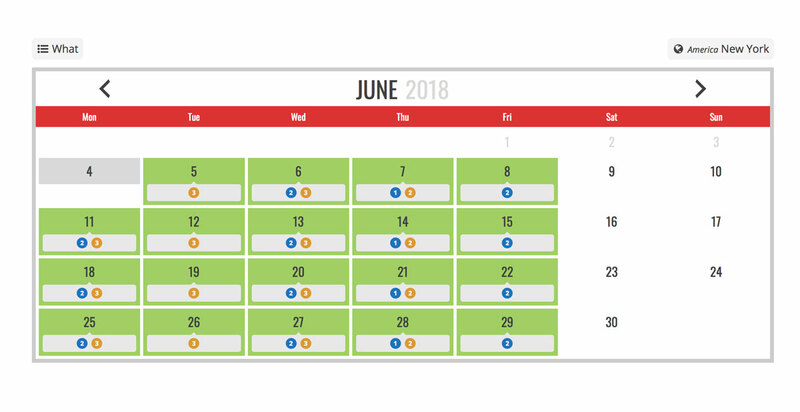 WP Booking Calendar is a Premium WordPress Calendar plugin that enables you to add a simple and powerful booking system to your WordPress website within a few minutes. 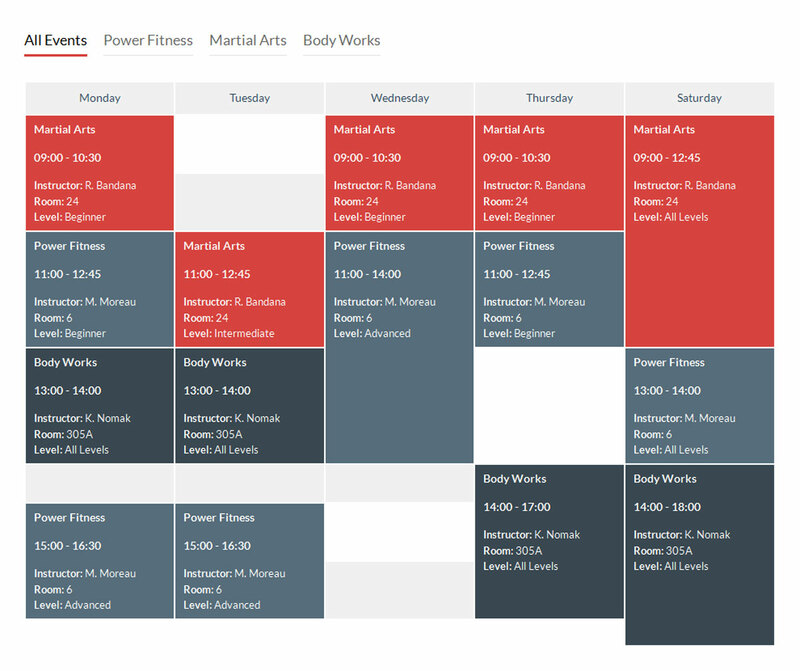 You can create a calendar for one or more services available for booking and set different timeframes. This will make your readers easily place reservations. The developers have tested WP Booking Calendar in high traffic websites and created many events with it to ensure that it is as effective as advertised. 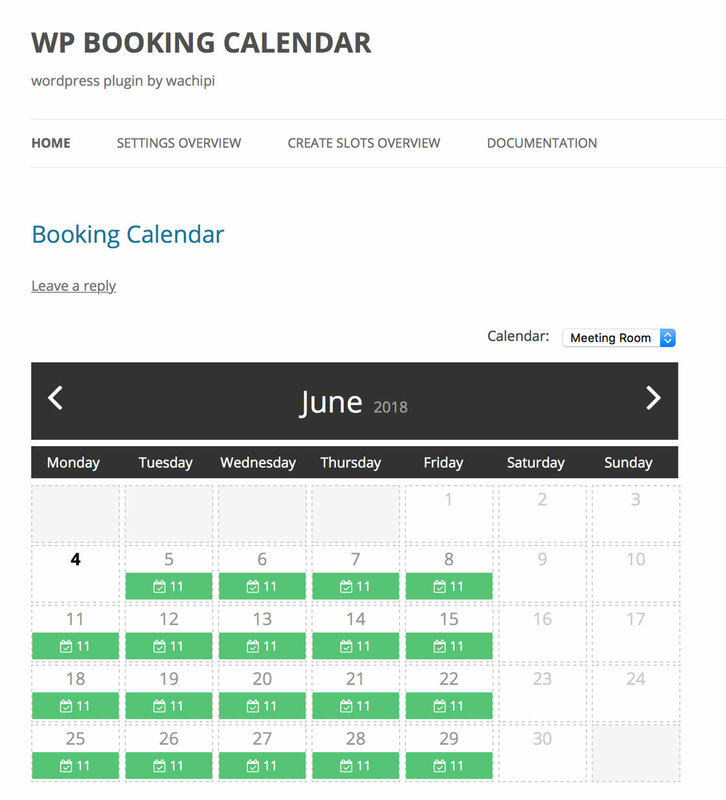 WP Booking Calendar supports WPML plugin to cater to your non-English speaking customers. Visitors can choose how to confirm reservations and pay for bookings via PayPal. This plugin allows reservation CSV Exportation. If you have been unsuccessfully searching for a Flexible, Powerful and Beginner-Friendly Event Calendar Plugin complete with timetable view, Timetable Responsive Schedule for WordPress is the perfect plugin for you. It is perfect for your Medical Departments, Gym Classes, Nightclubs and Pubs, Meal Plans, School or Kindergarten, and Class Schedules just to mention a few. 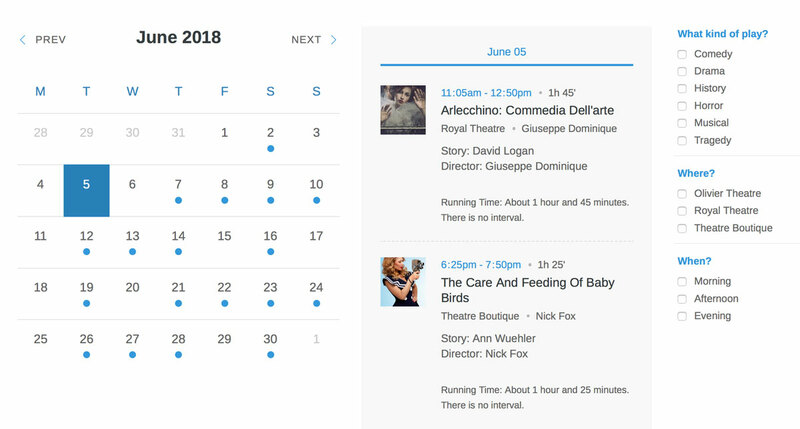 By using Timetable Responsive Schedule for WordPress’ custom post types for events, you can easily create new events in a moment. You are provided with multiple custom widgets, booking functionality and shortcodes to make your work easier. This plugin lets you play with the Fonts and Colors for each event you create until you find a color that best represents your event or brand. Team Booking is an Innovative and Premium Booking and Reservation Plugin for WordPress that has a fully responsive design to make it look good on multiple devices. This plugin provides you everything you need in a WordPress Calendar Plugin, including Google Calendar integration. One of the most powerful features provided by Team Booking is the powerful customization options that include tweaking the personal and general reservation behavior, maps, and confirmation email and frontend calendar styles. Team Booking is a complete booking solution for events, appointments, services, and rooms. You can export data from full reservations database and download the data as *XLSX and *CSV files. From Payment Processing to Ticketing Options, each of the above-mentioned Calendar Plugins WordPress has its own purpose. Choose a plugin that meets most of your requirements to handle the mundane event management tasks and concentrate on making your events more exciting. Let us know which Premium Event Calendar Plugin you use for hosting events on your website by sharing your thoughts and feedback in the comments section below.